Home LIFE	Who’s Been In Stores Thursday! Who’s Been In Stores Thursday! 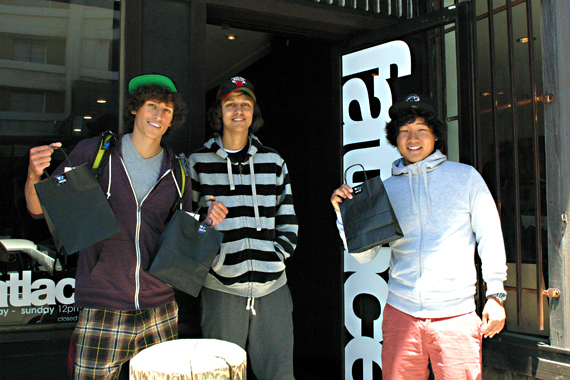 Mike, Garrett, and Andy made a quick stop to HQ today to pick up some Fatlace gear while they are traveling on their summertime road trip. They started their west coast road trip a week and a half ago starting from Chicago, IL making their way thru plenty of states and finally ending up here in San Fran. They seen the top part of the West coast and still have all of Socal and more to go. Thanks for stopping by and have a great trip! i came by the shop on sunday and grabbed a shirt 50% off. talked to the guys about cars for a bit. cool store.